Hi, My name is Christina and I am addicted to Cereal. Ok, now that that is out in the open let me explain. I love love love cereal. I could eat it at for every meal. Most days I eat at least 2 bowls. I like all cereal too, I don't discriminate. Sugary ones, healthy ones I love them all. So, I needed to find a healthier alternative and preferably something homemade. 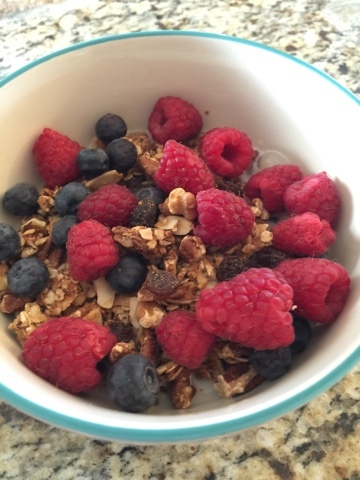 I have tried a few different granola recipes and this one seems to be the keeper. It is easy to make with all easy to find ingredients. Most you might have in your pantry already. In a small pot add in the wet ingredients- peanut butter, honey and brown sugar and slowly melt. In a big bowl add in all the dry ingredients except the dried fruit and mix it all up. After the wet ingredients are melted, slowly mix with the dry ingredients and spread it on a sheet pan. Bake for 10-15 minutes shaking the pan after 10 minutes. Watch closely so it doesn't burn depending on your oven. When it is all toasty and cooked up, let it cool. After it is cool add in the dried fruit and mix it all together. I store mine in Mason Jars or in gallon size Ziplock bags. It is ready to eat now by itself or as a yogurt topping. My favorite way is in a big bowl with almond milk and fresh fruit. I actually had a couple of requests asking that I post some meal ideas so I'm going to bring back Meal planning Monday's. I am a big proponent of meal planning. It's how I stay organized and also stay within our grocery budget. How I do it is by picking 5 dinners to make and 3 lunch ideas. I don't plan which days to make those meals ahead of time. I just have those ingredients in the house and depending on our mood or activities that day we choose what to make. This week since we have left over ham we are going to try to use that up Momday and Tuesday. We also have night actives Monday and Tuesday so I make something easy so we can eat quickly and get out the door. So this is what's on our plan. For lunches I prepped cut up veggies. Pepperoni, cheese, pretzels and hummus. We will also have peanut butter and jelly one or two days. Finally it has happened. I have collected all the pieces I wanted for the gallery wall in the living room. I've talked about this before but, our upstairs living room is a really odd shape. The traditional couch and love seat combo just won't work in that room. We had to get creative with the furniture and after learning that the tv could not be mounted above the fireplace we had to get more creative with decorations. There is this blank wall that stares at me ever day. I thought about just doing one big painting or something. I searched and searched but just couldn't find anything I thought would fit. 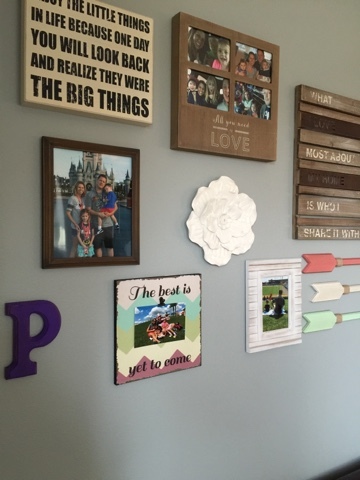 After searching Pinterest I thought the idea of a gallery wall would work. It seems simple enough right. 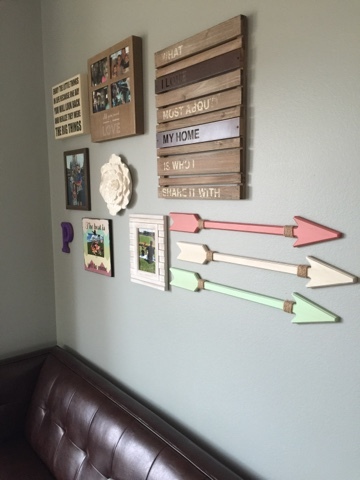 Just get a bunch of stuff and put it on the wall. Well, I wanted some color but not too much. I wanted pictures but not all pictures. I also wanted something a little extra but not so out there that it didn't look like it should go on the wall. So, this is what the final product turned out to look like. The arrows and white flower are from Target's new Pillowfort line. It has some really cool stuff so make sure you check it out. I made sure to use a level so everything is straight. I also didn't use any nails. Yes, you read that right. I used 3m command strips for everything. It was way easy and now I don't have to worry about 30 little nails in the wall. We aren't doing much to celebrate the day. I have some Corned Beef and Cabbage in the crock pot and we will probably be enjoying a beer when Mike gets home from work. Evelyn and I did make a treat for her class today. They turned out really cute. I found the idea on Pinterest from the Teaching Blog Addict and the link even had a free printable label. Check it out. It was really easy to do. 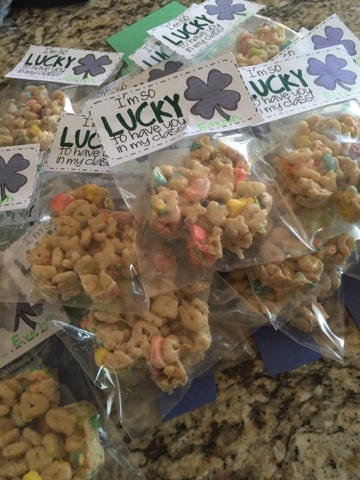 We made rice krispie treats with Lucky Charms cereal and then cut them into clover shapes. I put them in little bags and taped the label to it. I had Evelyn right her name on them too. Just at the bottom with a green marker. Click HERE and it will take you to the free printable. Enjoy your day and I hope you have the Luck of the Irish with you! We love love love pizza at our house and on the weekends you can find us surrounded around the Big Green Egg grilling pizza's. We have done lots of experimenting over the past year and have found some hungry neighbors that are always willing to test out our creations. 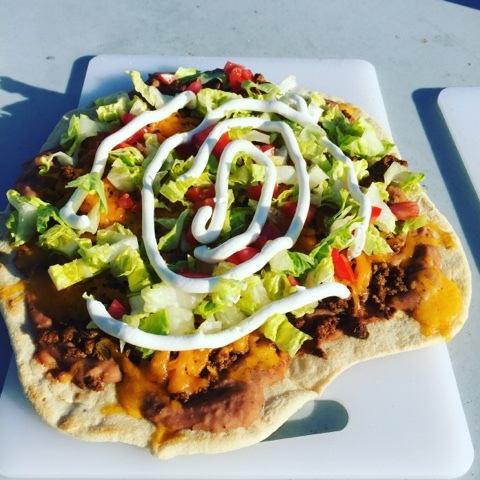 This past weekend we tried a few new toppings and this Mexican Pizza turned out the be the crowd favorite. It is a pretty simple recipe and easy to follow. I make our own pizza dough using the bread machine. It is fool proof and always comes out perfect. Add the ingredients into the machine in the order they are listed. Put the machine on dough setting and let it go to work. After it is complete, pull the dough out of the machine and put it in a big bowl. Put a towel over it and let it rise for another hour. After it is finished it is ready to go. I split the batch into 2 and make 2 thin crust pizza's on the grill. Or you can do 1 and it will be more like a hand tossed pizza. So after I roll it out to about a 12 inch round I put it on a heated pizza stone that is in the grill already. I let the first side brown a bit then flip it over and immediately put the toppings on. This Mexican Pizza is a twist on having an actual taco. The base is refried beans and taco sauce mixed. I used a half of can of beans and a half cup of taco bell's taco sauce. Then I put cooked taco meat on top of the beans. I used ground turkey that was cooked with onions and red peppers and then seasoned with taco seasoning that I made. The cheese comes on next. Lots of freshly shredded cheddar. Close the lid and let the cheese finish melting. When it is all cooked I pull it out of the grill and top it with shredded lettuce, chopped tomato and a swirl of sour cream. Pretty simple and so tasty.